The Chaophya Park Hotel offers 402 fully equipped guestrooms and suites, all tastefully appointed and refined with Thai artifacts. Each room has a minimum size of 37 m² and features IDD telephones, satellite television, electronic control panel board, safe deposit box, mini-bar, coffee/tea making facilities and a private marble bathroom with a separate shower and bathtub. Non-smoking floors are available. Open daily: Lunch 11.30 - 14.30 hrs. ; Dinner 18.00 - 22.30 hrs. Located on the 1st floor overlooking the lobby atrium, the Mori Grill offers a wide range of authentic delicacies from the “Land of the Rising Sun”. Savor Teppanyaki, Sashimi or Sushi in an atmosphere reminiscent of Japan. Experience unrivaled cuisine and the privacy of a Tatami room! Open daily: Dinner 18.00 - 02.00 hrs. Open daily: Dinner 08.00 - 22.00 hrs. An ideal place to unwind after a hectic day of business, sightseeing or shopping - our Lounge & Bar offers cocktails accompanied by piano melodies during the day and rhythms from a live band in the later evening. Open daily: 08.00 - 24.00 hrs. Our outdoor bar adjacent to the swimming pool ensures your refreshment with tropical drinks whilst relaxing in the sun. With over 2,100 m² function and pre-function room space, our banquet, meeting and convention facilities are amongst the largest in Bangkok. 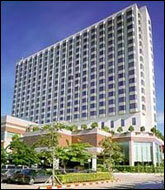 The Chaophya Park Hotel, combined with the Convention Center, offers 11 function venues. Each meeting area is equipped by state-of-the-art audiovisual equipment serviced by qualified professional technicians, individually controlled air conditioning and well appointed bathrooms and pre-function room rest areas. Chaophya Vej offers massage for all ages - including ancient Thai massage, oil massage, foot reflexology and baby massage programs. Our all-new first-class 247 yd. driving range in Bangkok is landscaped in Balinese style and fully equipped including automatic caddies, bar and restaurant. Veronica Elite Club is a newly opened exclusive club on Rachadaphisek Road. Truly unique from the moment you enter the elegant and modern setting with fine decorative accessories. If you consider yourself Elite then you deserve to be a member. Chatuchak Market is one of the largest markets in the world. Located opposite the old northern bus terminal along Phaholyothin Road (Morchit) it is a must for any travellers coming to Bangkok who has shopping on his/her mind. The market is only open at the weekends, Saturday and Sunday from 7 a.m. until late. Some of the stalls do open during the week but not sufficient to warrant a visit. Getting to Chatuchak has become a lot easier since the Skytrain and a newly Subway system opened and now you can simply take the Skytrain or Subway to the terminal Morchit.